Gigi started the Hipster Hat out of Pacific Knits.Jasmin has finished the yoke of the Playful Stripes Cardigan, but the button band was challenging. Gigi is working on the second incarnation of the sleeve of her Katje, but may do it again. Jasmin is making progress on the Kaanteinen Hat. Gigi needs to turn the heel of her Monkey Socks. 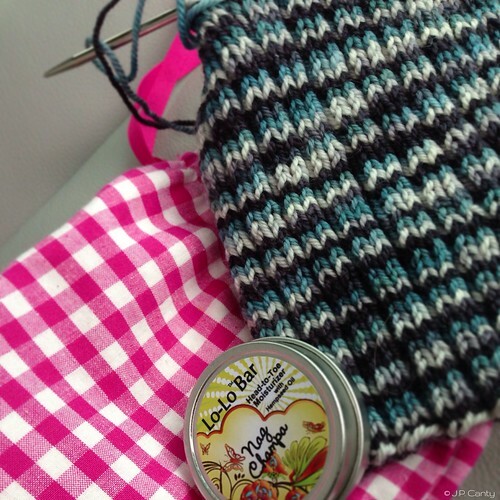 Her second Magic Carpet sock is looking beautiful, which makes the first sock look sloppy. She is thinking of knitting a new top and grafting it on the first sock, and after grafting the center of the Frost flowers stole, that should not be a big deal. Gigi has offered to pick up the stitches for the cuff of her Houdini socks. Jasmin and Miss Kalendar have decided to knit the Calligraphy cardigan out of the handspun she had earmarked for the Baby cables and big ones, too pullover. We are discussed some developments on Project Runway Allstars. It seems that creating drama keeps designers longer in this competition than good design. We are disappointed. We also mention Tim Gunn's Life's Little Lessons for Making It Work . Gigi has been wearing her standard socks, wristers and Knitmore Cowl. She accidentally mismached some Regia socks and they still looked like they belonged together. She wore her gray Citron- Jasmin has the yellow one. And she wore a big sweater out of Colinette yarn. Jasmin wore her Uber Cowl out of Cascade Magnum. Andrew has been wearing hats out of Noro. We talked about the Seam Allowance project, where people are trying to sew/knit 25% of things new to their wardrobe. Andrew wore gloves that Jasmin knitted for Andrew pre -ravelry. 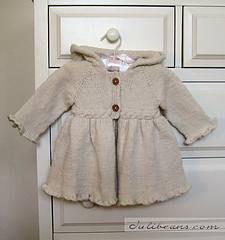 Genevieve has been wearing her Genevieve Coat and the lovely cardigan that Aimless knitted for her. We answered a question from the "What Do You Want To Hear About" thread, whether it is more economical to buy ready to spin rowing, or to buy fleece and have it processed. Jasmin recommends Morro Fleece Works for fleece processing. I am so in agreement with you about Project Runway Allstars. I'm not a fan of Laura Kathleen. I'm sorry, but her ranting about money and all she had made me want to say, "It's not all about rich!!" Should she have gone home for the vest of doom? No. However she made a ton of other awful things in her time there and I was done with her. I love the people they have left for tonight's show. All interesting, soulful desingers who have a bigger picture in mind. The only real problem for me is that Anthony Ryan should have gone home on that ombre disaster that showed he knew nothing about women over size six. Most women are larger and if you want to design for sticks, either move, or design for literal sticks. This country is curvy. I'm not, anymore, but I used to be very plus sized. I also cried when Josh left. I know he dressed like the flag from every nation with fruit on top, but he has taste and style. I love Uli, oh, I love them all. I miss the heck out of Tim Gunn to the point I almost don't watch Allstars. The judges are judges. One snark is always around and Heidi can deliver it too, but Dear Tim. I want to adopt him as my fairy godfather and miss him to pieces.